The salinity spike on top of a bad (ie too low) nutrient situation was the combined problem for your critters. My system creeped up to 1.030 a few years ago... the algae mix in my system shifted as a result, including a first-ever algae bloom, and hasn't been the same since. This was in a mature system full of stony corals too... super-high salinity is bad. I'd consider dosing phosphates until they stop registering zero on tests....your corals will see an immediate benefit. If you've removed the foundation problem (nutrient stripping media/additives) then the skimmer should be a benefit to the tank via aeration. Skimmers don't really do a whole lot of nutrient removal, depending on setup, and in spite of reputation. That is not something I would worry about. Pretty weird for nitrites or ammonia to be around long enough to see on a test kit if you added seasoned/mature live rock to the tank. How sure are you that the rock was "live" versus just "wet" when you added it to this tank? You mentioned the skimmer hadn't been running. Was the rest of the system running normally (flow, heat, et al) during these first three weeks? Can you take a water sample to your LFS to have them verify your test results...and maybe give you a reading on the phosphate level as well? Never seen it in person, but judging from the pic it looks like it might be a little more homogenous than the CaribSea products (both of which I've used). I'd keep it empty, personally. If you put something down there I'd heed @Clown79's advice to put it in a bag (or something) to make it easy to remove for cleaning. But empty is better...plus you shouldn't need any extra media. For what it's worth, I would forego the elaborate cleaning rituals and go for a conservative, old-fashioned start. (Unless you can switch to actual live rock, in which case I'd advocate for changing over to that instead....then an old-fashioned start.) Start with the rock in a normally-functioning reef tank, but without adding lights. They come later on with the coral. If there's some pre-existing algae growth on the rock then keep a CUC during this phase....snails and hermits. You work with them to pick/remove any and all offending algae growth. Do water changes as needed, but don't do anything that would drive nitrates or phosphates down to zero. If they are both measuring low, then don't do any water changes. Once you're satisfied with the state of the rock, add light and corals. Make sure salinity, alkalinity and calcium are under control so that coraline algae will take over, and not something else. Without control on those three parameters, coraline is unlikely to prevail against hair algae and worse. Add corals up to your comfort level and allow at least a few weeks for the tank to stabilize before moving on to adding some fish. That way if you have to add more CUC or make any other changes, you'll have plenty of time to notice before fish....which will be another big change. When you add fish, try hard to add no more than one at a time, and again wait at least 3-4 weeks before adding the next batch to allow time for you to monitor the new addition(s) and make any compensatory changes to the system that might be needed. Add new CUC if needed. 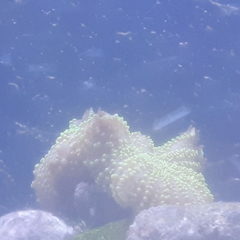 Add more corals if desired. Again, wait a few weeks if any new are added. Then add the next fish. Then wait some more. Etc. Until the tank is full. If you pace yourself successfully in a manner something like this, it's much harder to go wrong and much easier to make a course correction along the way than most of the conventional approaches. Unless it looks like it was collecting dirt while it was in there, it should be fine to use as-is. I wouldn't even rinse it off when I switched it to saltwater if it were me. Anything problematic (assuming the worst for no reason) is unlikely to survive the switch to seawater salinity. Most things living there should be useful vs harmful even if they were to survive into the reef though. On the other hand, if the media looks really dirty, rinse it off in some tank water and then use it. Still no worries. If it won't rinse clean, throw it out and get new. It's not worth a lot of bother. There's hardly anything more unnatural than a reef in water that flows in only one direction/in one pattern. On most reefs, the inflow and outflow of the tides create a strong shift in the overall current....usually creating currents in the opposite direction. IMO, if you aren't doing something to duplicate that strong two-way pattern in your reef, then you might be doing it wrong. 😉 If your sump outlets are on different pumps, I'd run just one at a time for around 3-4 hours before shutting it off and turning on the other pump/outlet for a similar amount of time. Each switch would be a total switch in currents moving through the tank....great for keeping detritus suspended AND for maximizing the effect of each head throughout the tank. Not much you can do if they're on one pump. As long as you're careful with redirecting the sump outlets and you don't end up with worse flow when you're done, then doing so may help....but not as much as putting a real rhythm into your flow. All it takes is (at least) two pumps and a pair of appliance timers (or better). The SCWD does something similar using only one pump if you can squeeze one of those into your config somehow.